We’re thrilled to have you on board as a Belong Member. We are super keen to have you enjoying great Belong offers. It’s time to Belong! Your employer has joined Belong because they want to offer you and your workmates a better benefits program. Your employer values you! You and your workmates are now Belong Members. You now join thousands of other working Kiwis as Belong Members. Belong Merchants offer great deals for Belong Members – deals you wouldn’t be able to get on your own. 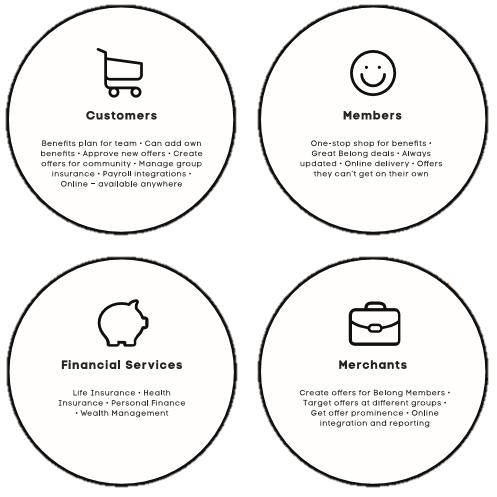 Belong Merchants know that Belong Members are working Kiwis – so they can create unique offers ideal for you. As our Belong community grows, we’ll continue to add new Merchants. What does that mean for you? It means a constant stream of great deals you can use every day! We can also provide you with access to great financial services offers and advice through our Financial Advice partner. Future planning for you and your family.